Annie, one of the owners of Christiania Bikes, just visited a bike factory in Nordhausen, Germany and sent me a mail about it. I had heard about the striking bicycle workers, but that was ages ago. Turns out they are still at it. 135 colleagues in the Bike Systems GmbH factory, faced with a factory closure, decided to protest and try to save their jobs. This was back in July 2007! As I understand it, the union rules in Germany dictate that only a union can call a strike, and not the workers themselves. Their union wasn't game so the workers decided to hold a "professional meeting" to discuss the situation. They are allowed to do so. There are, however, no rules dicatating how long that meeting can last. So their meeting went on and on and on. Brilliant move. In order to prevent the factory being dismantled they kept it occupied in three shifts. Eventually an idea was formed. Self-management of the factory and production. A product was needed and they came up with the Strike Bike, pictured above. 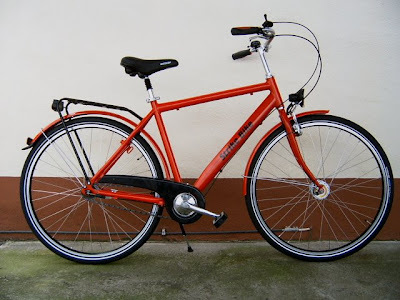 They recieved a wave of pre-orders for this solidarity bicycle and began production of it. 18 months later, they're still at it. 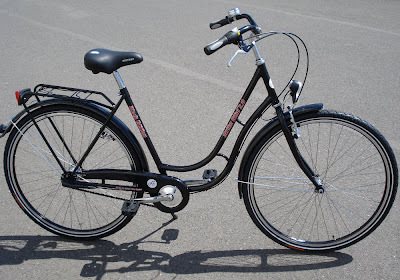 The Strike Bike 2.0 or Volksrad [Peoples Bike]in both gentleman and ladies models are in production.